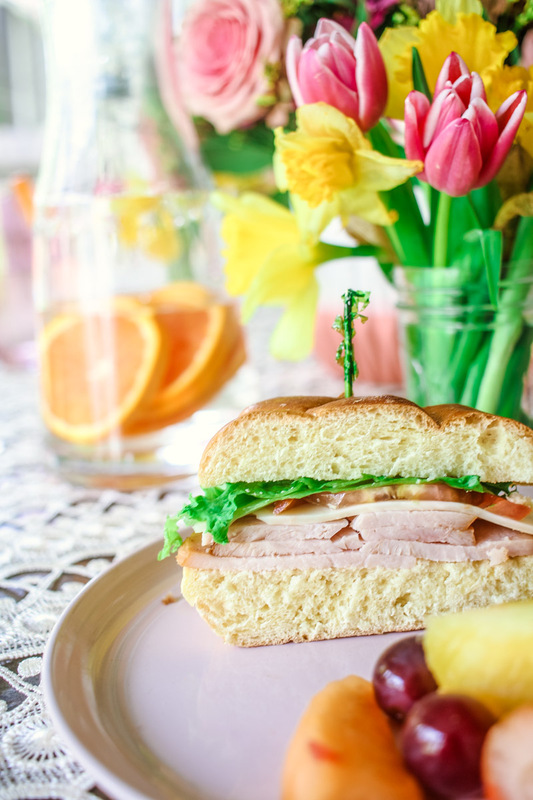 Spring Entertaining with Honey Baked Ham! 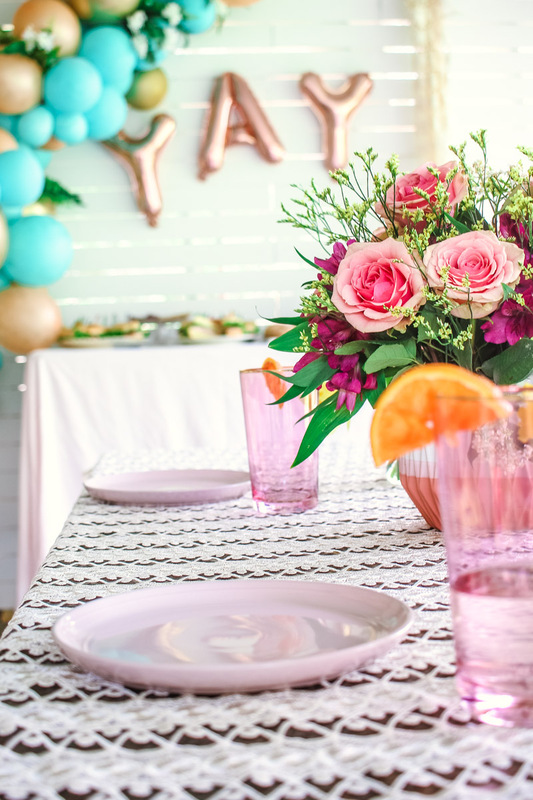 Hosting a spring celebration for friends & family can be stressful no matter how big or small the occasion. 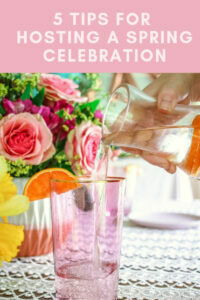 I wanted to share a Spring time celebration that could easily be put into action for a baby shower, engagement party or any spring celebration. Lately I’ve been LOVING the additional touches in a balloon garland, for instance I added faux flowers & ferns. I landed on faux instead of real since the balloon garland was made ahead of time I didn’t want the “live” elements to end up dead or shedding into food. I simply used fern & floral picks to soften the balloon garland and tie into the floral arrangements from the table. 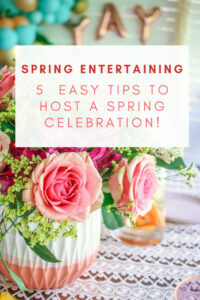 Originally I had this massive list of projects I wanted to create for this spring celebration. First I wrote everything down – floral chandeliers, balloon garland, flower arrangements & a unfussy menu that would satisfy. Well…umm I don’t have a crew of people, so how did I expect to pull this off? I went through my list to see what I could do without or outsource. Food, that was an automatic outsource for me. There was no need to spend a full day in the kitchen when I knew that I could have Honey Baked Ham cater (they deliver in my area too!). So, that meant no prepping food, making a mess in my kitchen & then cleaning that mess of a kitchen. 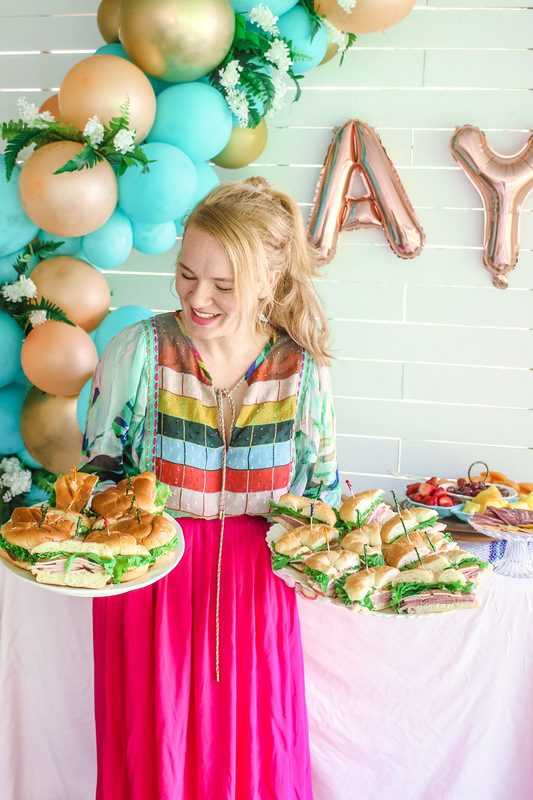 I just quietly slid food from the Honey Baked Ham trays onto some of my party ware to give it a personalized touch. 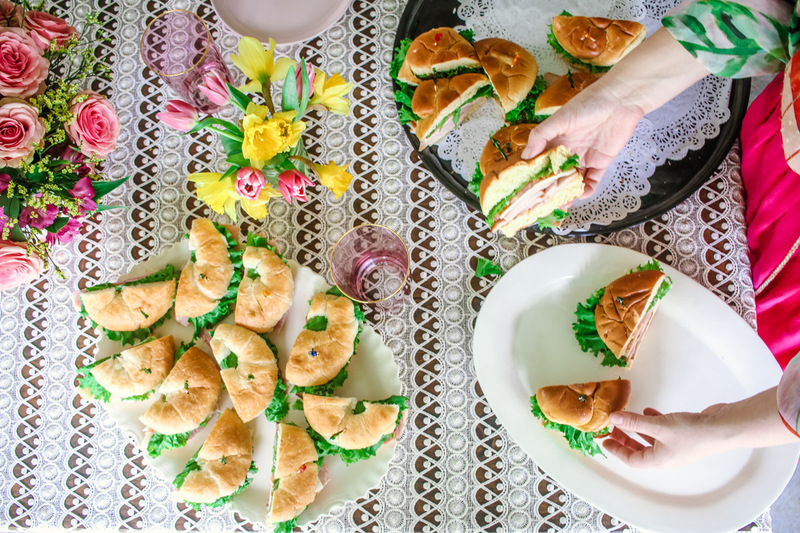 The sandwich trays, cookies & fruit are all from Honey Baked Ham catering! I’m not too tight when it comes to color schemes, I feel like an array of colors in the same family can make it feel laid back & not too fussy. And when we are coming into spring, laid back is what I’m going for. Originally I pulled out my trusty white linens but they just scream “DON’T SPILL ON ME” so I switched over to linens that are a little less fussy. As you might notice I did stay with subdued hues for the fabrics with the pops of colors being in the balloons & flower arrangements. I keep most of my linens on the subdued side so they are easier to use over & over again. And the beautiful lace table linen is actually a curtain panel I found while thrifting, when decorating a space it’s much easier when you think of your linen closet as just that…linens. 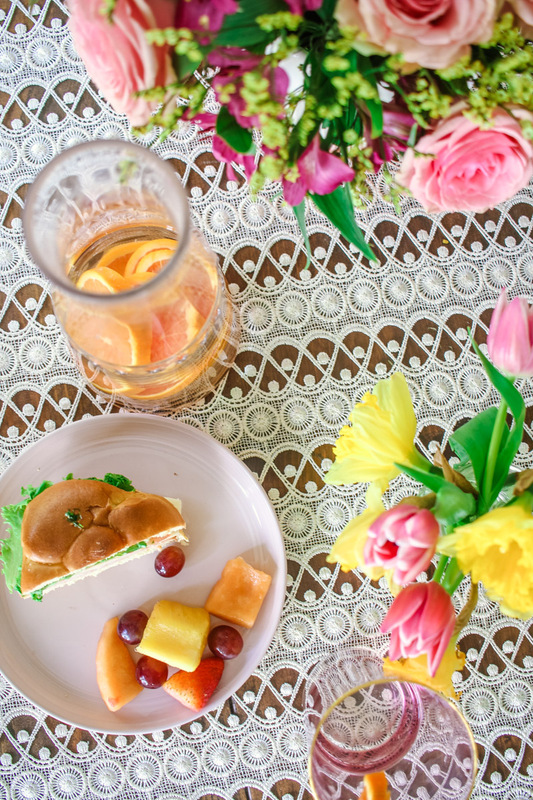 I’ll use curtain panels, sheets or random pieces of fabric in a pinch for a table cloth anytime! Thinking outside an item’s intended purpose opens up what you have to much more. Use glassware, bowls or pots for floral arrangements. It’s so much easier than you think to create quick arrangements on a budget, I stopped by the grocery store & spent $40 on the flowers & pulled out whatever vases (& mason jars this time) I had to create beautiful arrangements that bring life to the table. And remember make sure not to make your arrangements too tall, you want to make sure people at the table can easily look pass them to talk to each other. At a loss of where to start on arranging flowers? 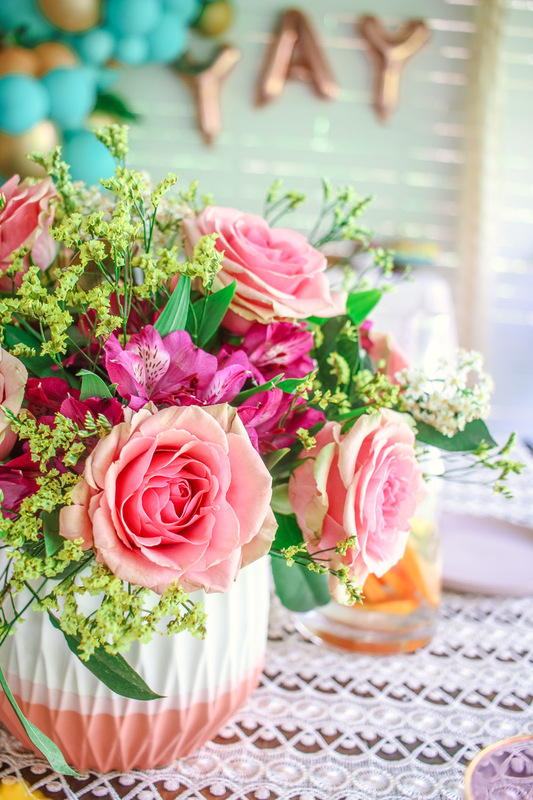 A quick Pinterest or Youtube search for “easy flower arranging” will yield a ton of options. One go to for me is to buy one type of flowers & just plop those in a vase for a minimalist floral arrangement. 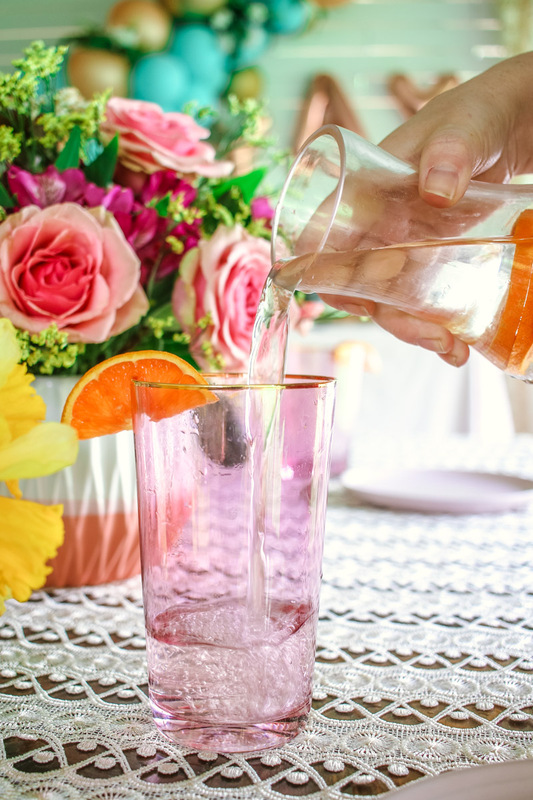 I’d love to hear your tip for Spring time entertaining in the comments below! WIN A $125 HONEY BAKED HAM GIFT CARD! My best entertainment tip is have a notebook for notes. So simple but can make all of the difference in keeping track of all you need to do. My beast entertaining tip is make a list so you do not forget anything. 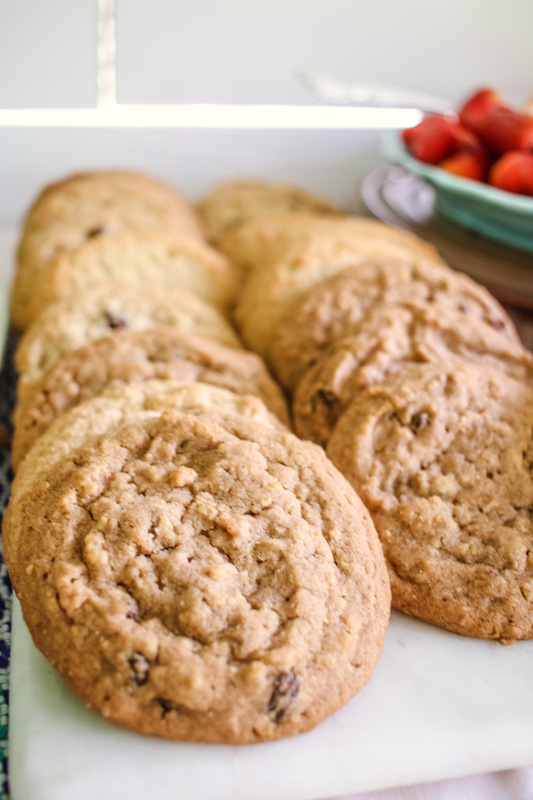 I like when guests bring one of their favorite foods, it makes the party more fun and less stressful. Have a kids area… be it a craft or just a coloring table for them! Best entertaining tip: focus on making your guests feel comfortable. My best entertaining tip is to get guest involved with the cooking and setting up of the meal or food! It makes them feel involved and engaged and it is a great conversation starter. My advice is to keep it casual and have lots of snacks. Boy!! Your asking the wrong person. 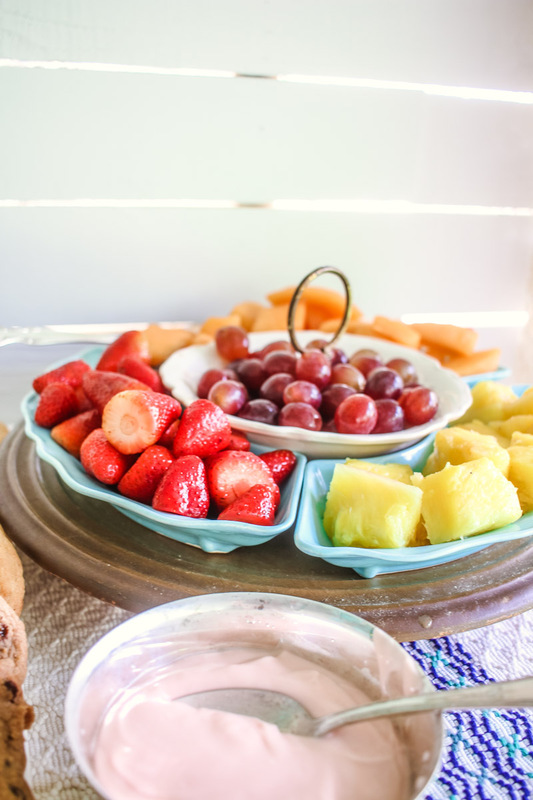 What i do is make sure I have a large variety of foods, snacks and sweets plus fresh veggies on a platter. So far Ive not ran into any major problems. They might not all leave stuffed but I know everyone had something. My best entertainment tip would be to make things simple so you don’t have to stress! I get easily overwhelmed when planning. I find that making a list and crossing items off when I finish them helps my anxiety and keeps me organized. Love the little details!! 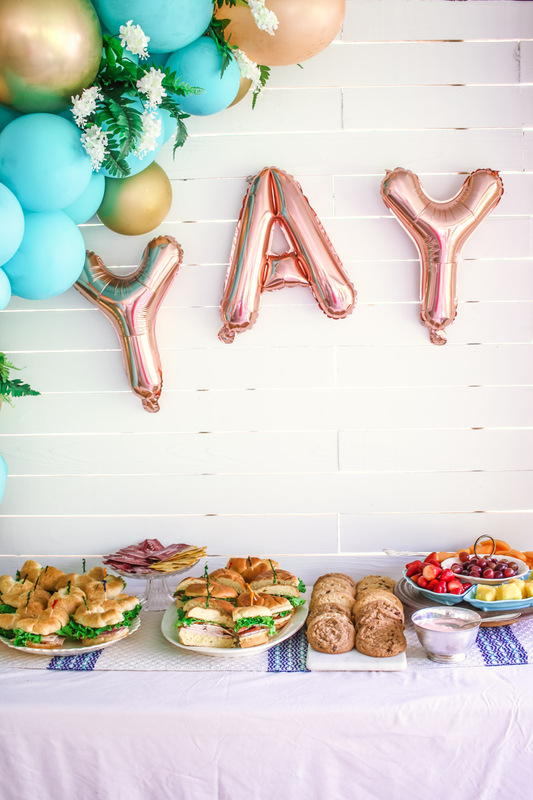 The greenery in the balloon garland is so cool! I plan way in advance the food menu and guest list so there’s no stress! My favorite entertaining tip is to not stress so much about entertaining, do it and have a good time and relax! As a side dish, I heart sweet vidalia onion pie! My best dip is a hot artichoke hearts dip, delicious! My best entertaining tip is to get invited somewhere so we aren’t responsible for the food or clean-up!!! When we have people over we limit it to just a few friends. If you have too many guests, it can be to hard to manage. Everyone is happy when there are pigs in a blanket. Favorite food to entertain would be Tacos! Taco bars are alot of fun. Make sure you enjoy yourself and don’t spend the whole party worrying. Cleaning as I go is my best tip!! Therefore, you can spend time with your guests without stressing about messes or having to leave to clean! My family love to make crab rangoon for get togethers. My favorite party food is loaded nachos!! My favorite party food is ring bologna and cheese or shrimp. My favorite party food: Nacho stuffed potato skins. Have lots of food and games! My best tip is make the food/snacks a few days ahead so you can relax and enjoy the gathering. My favorite party food is nachos! 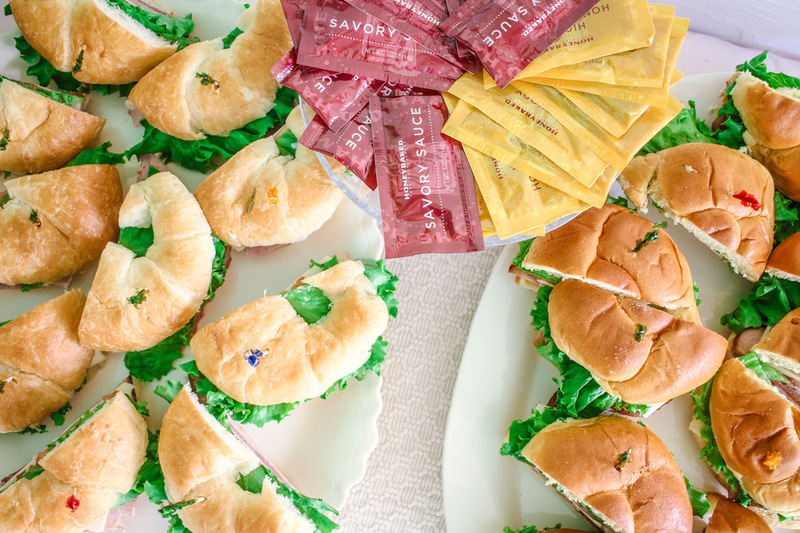 My favorite party foods are salami rolls and deviled eggs. My favorite party food is cheese dip. My favorite party food is nachos and rotel dip!